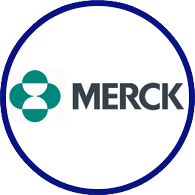 For more than a century, Merck, a leading global biopharmaceutical company known as MSD outside of the United States and Canada, has been inventing for life, bringing forward medicines and vaccines for many of the world’s most challenging diseases. Through our prescription medicines, vaccines, biologic therapies and animal health products, we work with customers and operate in more than 140 countries to deliver innovative health solutions. We also demonstrate our commitment to increasing access to health care through far-reaching policies, programs and partnerships. Today, Merck continues to be at the forefront of research to advance the prevention and treatment of diseases that threaten people and communities around the world – including cancer, cardio-metabolic diseases, emerging animal diseases, Alzheimer’s disease and infectious diseases including HIV and Ebola. For more information, visit www.merck.com.